I received an email titled "Fast Food: Advertising vs Reality" showing pictures of ads of various fast food items versus the actual food photographs and got some replies to the stark contrast between the actual and the advertised versions. I replied to the thread saying what they see on ads may not be food at all due to the tricks used by the food stylist in making the food subject look marvelous before the photographer takes over to shoot the "food." as you know, the number one tip for aspiring food photographers is to hire a food stylist, the second tip is to hire a food stylist, the third is to hire a food stylist, then prepare the lighting equipment and composition. for cereals, milk was replaced with white glue diluted so that the cereals won't turn soggy. food photographers might kill me for divulging these secrets! The gorgeous Pinky Webb photos captured in Boracay last March 10, 2008 where ABS-CBN's Umagang Kay Ganda had a live telecast. the exotic, sun-tanned and stunning Pinky Webb, a TV news anchor of ABS-CBN, ANC and of radio station DZMM. Daughter of former senator and tv personality Freddie Webb. She's also the sister of former PBA player Jason Webb and Hubert Webb (of Vizconde...). Pictures taken during Umagang Kay Ganda in Boracay Island's White Beach in front of La Carmela de Boracay Resort Hotel in Station 2. I just acquired a new camera three weeks ago starting with a slightly used Nikkor 18-200 VR from Atty. Raymond Fortun at PhP25,000.00, quite a steal actually for less than a month used lens. A few days later, since I can't stand the thought of having a lens but can't use it, went to Hidalgo, Quiapo to buy a new Nikon D80 DSLR at P34,000.00 with free 1GB SD card and camera bag. A friend suggested waiting for the replacement of the D80 or upgrade to D200 or D300 but it's actually out of my league besides being not cheap. The first shots of the camera were taken at Shawarma Snack Center near Robinsons Place Manila where we went for a food trip after. The real field test and sample pictures were at my recent trip to Boracay currently featured at Travel Philippines Backpacking Asia blog. Review and comments: the 18-200 VR is a great all-around lens at such range. Not intended for low light photography due to its being slow at f5.6. At around 100mm, you may have to stop down to f11 for the sharpness you're looking for. I intend only to buy a Nikkor 50mm f1.8, an UWA lens and probably a telephoto for butterfly and bird watching trips. Last Friday, Text messages from Globe's prepaid subscribers had a problem sending and receiving text messages. Some even reported lost loads while my sister complained of unlimitxt yet no messages can't be sent. The problem was only fixed last night after a few days. No official press release from Globe is available. Postpaid (plan) subscribers are not affected. I had the opportunity to see ATVs (all terrain vehicles) in action on Boracay Island racing with tricycles and bug cars (either 1 or two seaters). Herewith is a picture of an ATV parked near Mt. Luho view deck. prices are negotiable as always. 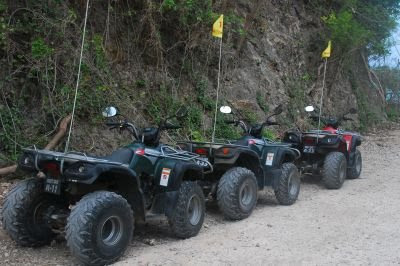 There are ATV rentals in Metro Manila so you try out the off-road beasts nearby. No idea of the costs though. The Pacquiao-Marquez was a very close fight and also very ripe for a third encounter if not for money matters and the plan of Pacquiao and Roach to move up to the lightweight division to challenge Mexican chmapion Diaz. Yesterday I drove on EDSA going to Pinyahan and found EDSA with little traffic. Went home around 2pm and the bout's just about to start on TV. I could've taken pictures of Pacquiao-Marquez 2 if wanted to since I already knew the result including the thrid round knockdown. Congratulations to Manny Pacquiao and the Philippines! The Philippine Lotto's grand prize is now a whopping P162,200,000.00 and counting. Many Filipinos maintain a set of magic numbers that they hope to be the next winning numbers to the grand prize of PCSO Lotto. How many tickets do you need to buy in order to win the lottery? I depends on the system, for example Philippine Charity Sweepstakes Office’s (PCSO) Superlotto 6/49 requires you 6 numbers out of a pool of 49. In mathematical terms (probability and statistics), it translates to a combination of 6 out of 49. How to win the Lotto Grand Prize? Simple yet requires a lot of capital and lotto outlets unless you can automate ticket printing. Risks: There might be more than one winning ticket so you have to share the grand prize with the other winner/s. EZ2 requires only two numbers while Swertres, three numbers. Historical Trivia: Jose Rizal, Philippine National Hero, played and won the lottery in 1892 while in exile in Dapitan. The country's largest bank in terms of assets, Metropolitan Bank and Trust Company, has been down since yesterday due to system problem. I can't exactly say what is the cause of the problem out of courtesy to my well-placed contacts inside the bank. I was informed of this yesterday and up to now all their ATMs are off-line right smack on a coming payday. An update just came out that issuer transactions will be up today. This problem involves Metrobank subsidiary, PSBank. Just imagine the huge loss in transactions for on-us/proprietary, switched/interbank and credit card cash advances. But the biggest loss possibly in on their own customer confidence in them. Janina San Miguel fumbled with her Question and Answer portion of Bb. Pilipinas 2008 beauty pageant with her reply (or non-reply) showing how ladies vying for the coveted title has the beauty and body but lacking in brains in a contest where brains play a big part. Earlier, at the Philippine Senate's investigation of the anomalous ZTE Broadband deal, Sen. Ping Lacson was surprised when his "surprise" witness, Leo San Miguel, avoided questions all day long that contradicted statements of the whistle blower Joey de Venecia III and star witness Jun Lozada. Senate investigations are really full of lies and deceptions! It's also ironic that San Miguel district of Manila is also the seat of Malacanang, where the throne of the Iron Lady is located! I received this email from a forum I've been lurking in and immediately opened it. From the moment I read it, noticed it already as a hoax, know why? News like that are announced officially in Nikon's site, other official channels and not via email only! us decide to finally put up NIKON Philippines sooner than we opt to. So expect more announcements soon about NIKON Philippines. While bloghopping I noticed several blogs with PR3 or PR4 now with PR0 (no pagerank) according to my SearchStatus add-on of Firefox. One of them even blogged about her experience (in Filipino) when she received an email supposedly from Google warning her about paid posts (like Payutoblog and others) for $5/post or use the "nofollow" tag. Note: I once applied for paid reviews at PayPerPost, got approved, but didn't continue with it nor write a single paid article.